Reviewing a Marvel movie these days seems impossible without discussing the fan industry complex that surrounds, subsumes, and otherwise create endless speculative articles about what character will show up, will he/she be played by what actor, will it be faithful to “continuity,” etc. The original Marvel Comics group—generators of colorful, ink-stained rites of youth for so many— rebranded itself several years ago as Marvel Entertainment, with all the cross-platform synergy that implies. Simultaneously, there has been a rise of comic book and film blogs that report and opine breathlessly about the latest Marvel rumors, no matter how minor or refutable. The critic is in a quandary, wondering where to begin when every single possible plot point about Guardians, whether or not it actually shows up in the movie, is already revealed, synopsized, and judged, right up to the after-credits sequence. This problem is compounded when, say, the critic is a big Marvel fan from childhood, and generally wonders why fans seem so much more invested in the MCU (Marvel Cinematic Universe if you aren’t hip on the lingo) than the original Stan Lee/Jack Kirby 60s comics that have generated several billion dollars’ worth of revenue. Guardians of the Galaxy, the latest franchise, at least marks a minor departure because it is based on Marvel properties from the 70s, not the 60s. The period after Kirby left for DC Comics and Lee gradually ceded the reins to his protégé Roy Thomas was a different kind of artistic renaissance for the company. Thomas hired a bunch of far-out writers and artists who included Steve Englehart, creator of Peter Quill/Star-Lord, and Jim Starlin, who created Drax the Destroyer, Gamora, and Thanos among others. In his book Marvel Comics: The Untold Story, Sean Howe describes how Englehart and Starlin (who together created the Bruce Lee knock-off Shang-Chi, Master of Kung Fu) would “ingest LSD and wander Death Wish-era Manhattan at all hours.” This gives you an idea of the level of storytelling in the Marvel 70s. 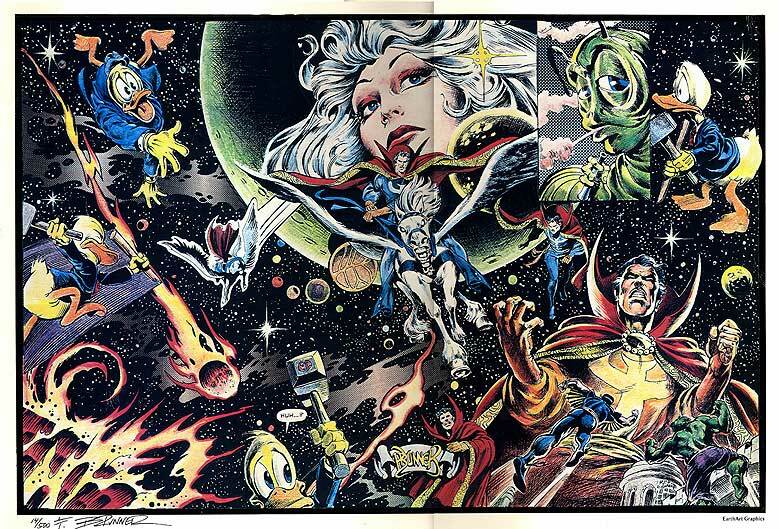 Big, cosmic ideas—not all of them coherent—came to the fore, and Starlin in particular wrote and drew vast, sprawling stories where Captain Marvel the fallen Kree warrior was imbued with “cosmic awareness” and battled abstract concepts like the personifications of Eternity and Death. If you think that sounds out there, don’t get me started on the acid fever dream that was Englehart’s Dr. Strange. Fast forward 40 years, and writer-director James Gunn, a graduate of the Troma school of filmmaking, is tapping into that same mad, drug-inspired storytelling style, at least as much as an auteur under the purview of Disney can. Guardians of the Galaxy may ultimately be unreviewable, but that is in part because it is so delightful. It aims for sublimity, particularly of this visual kind, and there are several moments where it achieves this. The rich colors in the film defy recent sci-fi trends, consisting of bright reds, yellows, purples, and greens, evoking the four-color comics of the past. The script is so well-oiled it sometimes feels like events are rushed to make running time, but it smoothly assembles a superhero team in a way that feels organic as well as sequel-ready. Guardians of the Galaxy includes characters so minor, who appear so infrequently in comics, that many were confused when this movie was announced: cynical observers may have felt that this film exists based on Rocket Raccoon’s potential “toyetic” properties rather than any recognizable or beloved comic. Then again, this could also be seen as a message from the studio that the Marvel bench rolls deep. Which is something any seven-year old with a comic collection could tell you, but studio heads tend to be a bit more dim. Chris Pratt plays Peter Quill or Star Lord, an earthling abducted by aliens as a child in 1988. We meet him as an adult dancing to “Come Get Your Love” by Redbone as he hunts a mysterious artifact in space, the orb. The orb is wanted by the lunatic Kree Ronan the Accuser (Lee Pace), who refuses to abide by a peace treaty between the Kree and the planet Xandar, home of the Nova Corps. As Ronan murders Xandarians throughout the galaxy, it is the Corps who finally capture Quill, a wanted thief and ravager, and in the process they also capture and jail a motley group: Gamora (Zoe Saldana) daughter of the feared genocidal titan Thanos, who also wants the orb; Drax the Destroyer (Dave Bautista), a revenge-bent green knife-wielder; as well as Rocket and Groot (voices of Bradley Cooper and Vin Diesel) a tiny raccoon-shaped Beatles reference and a trisyllabic talking tree, respectively. Shockingly, the group does not get along very well at first, but they bond as they escape from prison and try to keep the orb out of the hands of Ronan. Visual jokes and references abound for the serious Marvel fan to drool over, while kids will be enchanted by Rocket and Groot’s touching friendship—they both get a lot of standout moments. Other fans will enjoy the carefully doled-out character-based humor (Drax’s inability to understand metaphor is particularly funny) and the special effects are up to the usual Marvel standard. Standout scenes in this regard include a brief and frightening scene with Thanos, a series of Nova Corps spaceships that generate an interlocking force field, and a scene involving Peter’s fellow ravager Yondu Udonta (Michael Rooker) that is a demonstration of the most bizarre and delightful Marvel superpower I have ever seen translated to film. The “so-called experts” of the fan speculation industry are already lining up, far in advance of the movie, ranking it as here or there in the extended Marvel canon. Whatever. If you go into Guardians thinking of it as an extension of the Marvel brand, you are likely to see some flaws, like the fact that tertiary characters like Korath the Pursuer (Djimon Hounsou) and Nebula (Karen Gillan) get a few scenes each, while Benicio Del Toro barely gets any time to demonstrate his ace Bowie impression as cosmic hoarder Taneleer Tivan (aka the Collector). They will probably get their moments in the sequels. If you look at the film for what it is apart from the other Marvel movies, a rousing space opera in the tradition of Star Wars and hard sci-fi pulps, then Guardians seems more special, a throwback to a type of sincere, passionate character-based sci-fi spectacle that few filmmakers seem interested in making anymore. The film is spry and spirited, and it is aided, not hindered, by sublime special effects and bright vivid colors. Whether or not the Marvel brand lasts another 50 years, Guardians will continue to charm and delight new generations of viewers on its own merits, not as an interchangeable cog in a superfranchise. For this old-school fan, the Marvel movies continue to captivate, in spite of the increasingly toxic online discourse that surrounds them.